Like a lot of boys, I was interested in cars. You might say I was nuts about them. I drew them at the drop of a hubcap — filling the margins of my schoolbooks with their curves. Perversion? Maybe. One just automatically draws the things one loves. In my case, I drew them from memory. Yep, I could do a pretty good ’53 Chevy or a ’36 Cord while making a cameo appearance in Math 101. Fact is, I knew the principal characteristics of so many models, I was able to extract their essences from my mental bank. The trouble with reference material is that we tend to paint that tree, that rock, or that barn in the specificity we happen to have in the reference at hand. On the other hand, with loved images dragged in from recollection, we tend to catch their spirit. Let’s take larches. I’ve been painting a lot of them lately. Larches are the high-mountain conifers that turn yellow in the fall and eventually lose their needles. With a charm of their own, they are often scraggly and seemingly ill-designed compared to say pines or hemlocks. Their eccentric branches reach in unexpected directions and take un-treelike turns. Up in the mountains last summer I made myself spend a few hours getting to know them. Rather than trying to render a specific larch, I was looking for larchness. Painting, as I’ve said a few times before, is a matter of cooperating with the needs of the painting. If my painted larch is needed to reach out awkwardly in the direction of another pictorial element or shy back from one, then so be it. To heck with how the larch in question actually was. To understand the characteristics of things, it doesn’t hurt to assign anthropomorphic connections. Larches reach out, droop, befuddle, dance, embrace each other and inadvertently pray to the sky. These sorts of considerations help imbed vital characteristics in our mental banks. There’s another benefit: having insider knowledge helps us love the stuff even more. Without necessarily going all the way to caricature, the end result can be work that has character. Esoterica: Awareness and observation are the habits of blessed artists. It is our life blood. “Art,” said Vincent van Gogh, “demands constant observation.” It’s not only profitable but one of the greatest of life-enhancers. “A heightened sense of the observation of nature is one of the chief delights that have come to me through trying to paint,” said Winston Churchill. If you’d like to read some excellent quotes on the fine art of observation, some of them by you, our subscribers, please go here. When I was a young teenager growing up in a south suburb of Chicago and taking private art lessons in the basement of Julia, an elderly woman in my town who was known as THE artist to take lessons from, I remember learning to draw trees… and hating it. I copied trees from a stack of picture books of all sorts, all the while silently grumbling about the task. I just couldn’t seem to get the hang of them and Julia knew it. During one lesson after Julia handed me yet another forest picture to draw, I grumbled quietly to my friend, “I hate drawing trees.” Julia immediately turned around and announced, “Mary Ann, I heard that. Now you are going to draw trees until you love them.” I groaned. But Julia knew just what to do. She had me get my jacket on, handed me a stiff board to rest my drawing pad on, and told me to go outside and pick one tree in her yard to draw. She told me to first study it, really look at it for at least 20 minutes before I even started drawing. She told me to study it so well that even if I came inside afterwards and wasn’t looking at it anymore, I could still draw it. So I did just that. The challenge became a game. By the next week I was asking HER if I could go outside and choose a different tree to draw. She smiled and shoved me out her door. I was hooked. To this day, I LOVE to draw trees. Each one is unique, each one has character, yet I know how to capture their ‘treeness.’ That was the key. Now I can even make them up anytime I want out of my imagination. Julia truly was THE artist to take lessons from, and I am forever grateful. I often sit in my kayak for hours, just watching the grasses, water and trees. I like to feel the sun, the breeze, and watch nature as it moves through the day. 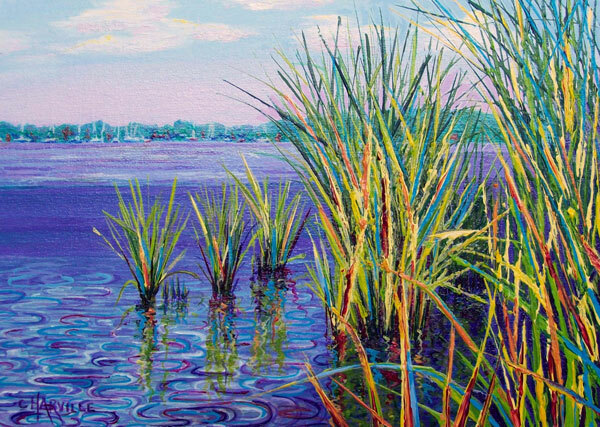 Whenever I paint river grasses, and reflections in the murky water, they look nothing like the photograph. In fact, when viewers of my work say that it looks like a photograph, I shudder in silence, and sheepishly say thank you. Then I go to the ladies room to vomit. But most people say, “I love your colors,” and then they keep looking, searching for words to describe what they see. At this point I tell them that I try to capture the “aliveness” of the water and grasses, and how they move and interact. Often they get it. Sometimes not, and they ask, “Why is the water purple?” Another session in the ladies room, losing my lunch! All kidding aside, I love to paint with a reference photo nearby, just in case my brain needs a refresher in real life. Then I go back into “Cathy’s world,” to paint what my heart sees and feels. I rarely look at the photo while I am painting. And my heart rarely disappoints me! Thankyou Cathy. I’m so glad I’m not alone in this. It’s MY painting and I’ll paint it the way it seems right for me. My wife and I have been Artists for thirty-five years now, and we both agree wholeheartedly with your statement about painting what you ‘see.’ I seem to irritate her by painting from memory those things that I’ve stared at for so many years (I tend to stare at a lot of things), and she prefers to resort to ‘hard copy’ visual reference. No fault there, however, I find that I tend to respect the subject more when I DO have the hard copy in front of me. Sometimes I feel that I’m withholding the truth from the viewer if I wing it without reference. Like you, I enjoyed drawing the cars of my childhood days, and then morphing them into the car that I desired to see. Often wishing that I’d gone to Detroit after Art School (Ringling School of Art), but it gets way too cold for my liking (weenie!). Character, is it defined by observation? Awe yes observation, so delicate yet so bold it can be. One can look and never see, unless one knows that looking has little to do with actually seeing. Observation, as often defined, is an art unto itself. It requires a discipline that many move hastily beyond because it requires patience that eagerness can dismiss as wasted time. So to master observation one must surrender to the process, letting go of pre-conceptions of what will be and let what is flow in, like the randomness of a gentle breeze. I personally find the art of observation to be a spiritual experience that with practice becomes less about observation and more about feeling. Therefore, it would seem that in order to truly experience the character of something, we must quiet our monkey mind and let the experience of the object wash through our senses requiring little more than the acceptance of what is. 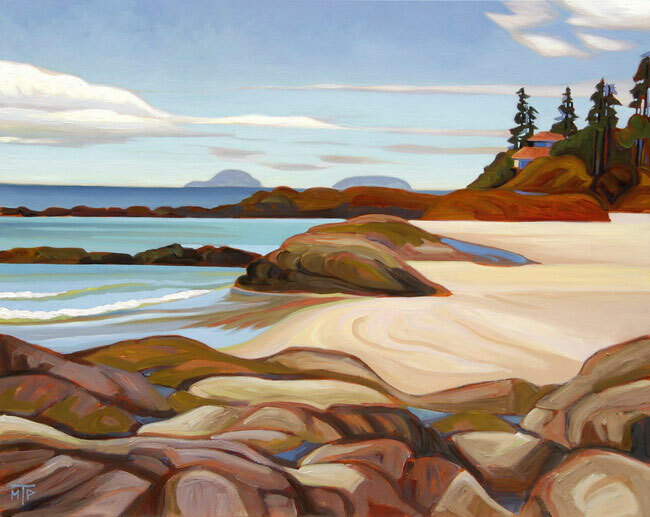 I was just recently thinking about the Canadian landscape art ever since the Group of Seven (and those preceding them) to these days when Canadian landscape paintings are being reviewed, revisited, and enchanting a new generation of artists and collectors all over again. What makes the Canadian landscape different and why do I paint it even though it has been, is and will be painted so much by so many people? Why is it so unbearably seductive, addictive, delightful, gets under one’s skin forever? My thoughts took me beyond the “treeness” and “typical landscapeness” to the “beyondness” which I think is the essence of this place. That is something that I wasn’t able to comprehend when I first immigrated to Canada — to the point that I wasn’t really even seeing it. Coming from a part of world where the nature is tamed, either beautified or destructed, seeing wild things needed an entirely different pair of eyes. 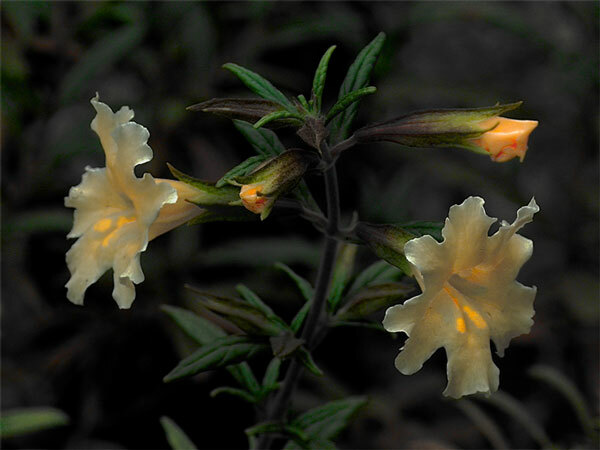 If one is used to looking for pre-composed, they will most likely miss paying attention to what appears on a first glance to be misfit shapes and even wondering “where is the nice stuff” — ignoring what really is the treasure of the nature. The point of view needs to be readjusted to see and feel everything, from things subtle, to implausible sometimes even frightening. For me, Canadian Landscape has this additional ingredient of oddness, abundance of things unexpected and stunning. Who would have thought that rock or branch, or fallen trunk could have that particular shape and position? How is that color of bark or sand possible? The effects of fog, the play of sun on the mountain slope, the doings of storms and forest fires, countless conditions that make up our landscape. It all composes itself into great surprising patterns which burn into our minds and hearts. That’s what I must paint! I guess, what I am saying is that I think that a larch misshaped beyond its “larchness” could still carry a painting. Perhaps, in my mind, this is a land of opportunities which don’t exist anywhere else! Beautiful painting. 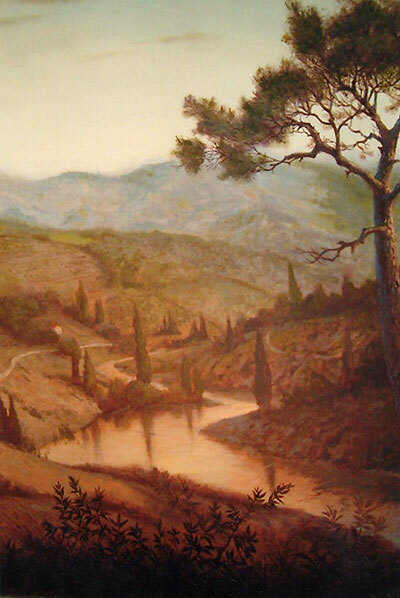 The simplicity of the landscape is greatly enhanced by the artist’s eye. I love this painting! Keep coming back to look at it. I like the perspective from close to the ground in the foreground and how it leads you to the beautiful, light-filled horizon in the distance. And I enjoy how you simplified the elements, yet they are still representative. Thank you for such a compelling picture! Thank you Liz, Larry and Bonnie, it’s wonderful to hear your kind words. Yogi Berra stated, “You can observe a lot by just watching.” Finding the characteristic in any subject is difficult for me as I tend to want to paint, draw, or embroider the specific one in front of me. I’ve tried taking it away to go at it from memory but keep coming back to that specific one. Even doing a loose drawing to use as my pre-painting doesn’t help. Your suggestion is that I need to observe thousands of this same subject till it is an automatic recall? B.J., however you are doing it must be right: this is a spectacular piece, with layers of meaning. How someone else does it is irrelevant. You are doing it the way that works for you. Each element in nature has an ‘abstract signature’ whether it be a larch or a willow or a flowing stream. Observation will reveal that signature to an artist and the end result in a painting is a sense of authenticity that the viewer will ‘feel.’ On the flip side of being over-specific, there is the twin problem of being too generic. I see many landscape paintings where I don’t get the sense the artist has ever walked in a field or looked carefully at a tree. My brain is just not convinced and it’s a visual bore. The artists have neither described an individual tree nor observed the abstract signature behind it. The whole concept is about observation and also about love. You mentioned how your love for cars inspired you to draw them. To paint a good landscape you have to love landscape. It applies to other sorts of subject matter as well. Observation combined with love is a winning ticket for the painter. I love this statement: observation combined with love is a winning ticket for the painter. Lately I’ve been attempting a subject I’m really not that interested in and my results are depressing. Back to my passions for me! My point of view is that all of reality is simply a collection of mappings and mappings of mappings and mappings of mappings of mappings. The viewpoint is important to consider because through its consideration, we can learn to play with the mappings and our play has significant consequences. Unfortunately, some of the consequences are very hard to experience. Ultimately, such play evokes joy and joy is the hardest thing in the world to handle. I have been working on this for 59 years, and now, at 60 I have finally passed through a gate where I realized that finally I can tolerate joy on a daily basis. I am not talking about the joy found in either religion or self-help books. I am talking about the joy that is no fun, the joy that in order to carry it, you have to share it, the joy that can scare the hell out of you because of its freight train force. My work is now about the human dilemma, the paradox of each person being infinitely precious, yet at the same time infinitely small and insignificant. In order to bring these two aspects together, I have to play with the maps and doing so ends up with art that has mixed appeal. The work provokes, but not in a way one expects. I also enjoyed drawing cars as a youth and still do, painting plein air vehicles appear in subjects everywhere. Sometimes I park mine in my scene as I know it will be there until I finish. Sometimes I paint vehicles outside my studio when the weather is poor, I always have a nice one as a work in progress when holding my open studio. I have properties that I am welcome to paint older vehicles as they fade back into the environment, at one they refer me as the painter in residence. 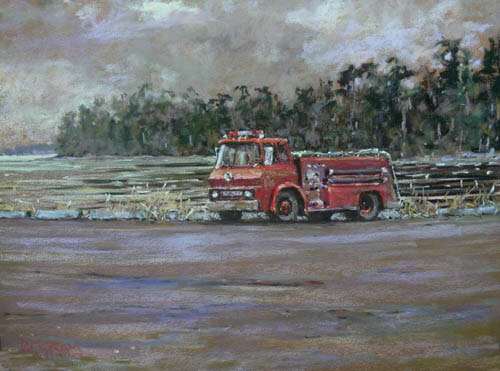 My second painting of 2010 is of Chemainus Fire Truck #4, awaiting transport at French Creek marina to Lasqueti Island (then back into service), a truck at the shore what a great way to start the year. Like a lot of boys I was interested in animals. Growing up in India my nanny took me to the Calcutta Zoo every Saturday, to see her boyfriend, the mahout of the elephants. Some visits stand out in my mind with emotional clarity: Parked in my buggy in the shade of the old female elephant, her trunk swinging towards me and back again, and her warm, yeasty breath. Later, in Guatemala, I got hooked on airplanes: I was a happy kid when clambering about old planes like Harvards, Mustangs, Northrop Black Widows and a Sabre or two in the airport junkyard. This fired dreams of becoming a pilot; my schoolbooks were crammed with airplanes which I could draw from memory from any given angle. I now thank my lucky stars that a profound disinterest in maths torpedoed that career option, because it left me with the only other option anybody could see: art. I was pretty good at drawing airplanes attacking convoys of elephants, and knights unhorsing each other; some farsighted person at the art academy saw through my childish appetites something of interest and I got in. The planes and knights never resurfaced, but animals persisted throughout my studies and are still a major theme in my work and life. It took a good deal of study, and the maturity that comes with study. At the outset I was so bent on getting it right that my reference material — mainly dead and injured birds 00 overrode the art, the paintings failed to jell. I had difficulties understanding my mentor’s remark that I was “too much in love with my subject matter.” It took some time to realize that you need a little distance to let all that makes a painting interesting come into play. Now I tell my students the same thing. Art is about catching the spirit of what fascinates you. That may be achieved with or without the use of detail, as long as there is some deep truth in the painting. This truth may come from a deep connection with and understanding of the subject, which allows you to keep juicing up your mental archive. I believe that regular observation is more important than the use of reference material like photographs and dvd’s, it imbues your memory with a vitality because of the quirky and unexpected nature of reality, and adds to what is “characteristic.” Seen thus, there is actually some good in humans being on earth: we bear witness to what is here still, even if we feel that what is valuable is slipping through our fingers like grains of sand. As a collector of art, I find that many painters do not take the time to understand the objects they are painting. Maybe this has got to do with poor training, but I don’t think so. It has to do with a “good enough” attitude. I like to see style, and yet the underlying structure is not always there. This is particularly true of figurative work. It seems to me that really good artists understand their subject matter (I’m not talking about all the detail in choo-choo train paintings) and can paint their passions freshly and confidently. It shows! The lovely fat “Letters” book arrived here yesterday (Thursday) in it’s protective case after only six mail days since I ordered. I just love it. It puts the letters in a new perspective–each paragraph a gem of information and insight. This, finally, is the book that others might have written if they only could. I used to think of getting the quiddity of an object as finding its “pattern”. Once you have the pattern of anything (like the proportions and gesture of the human figure) you can draw it whether it’s in front of you or not. It also helps you see better when you are drawing something you’re looking at. I still don’t have good patterns for trees, but I’m working on it. This is sort of a companion to “What to Paint”. In my prior life I used to give technical presentations to bio-science professionals an I learned very quickly I had to know my subject as well or better than my audience to be an effective presenter. That’s what artists are: presenters, story tellers. We artists should paint what we know, what we like, what is important to us. Those are the things which we see, understand, like, and think about most, those things which fascinate us. Yes, but…as we often say; yes, but if you love certain things so much that you tend to paint them over and over they become a cliche. I, and many other artists, love old buildings. I have painted the ones that have really been there and I have made up many. I know how they are built and how they look. In fact, not long ago I made up and painted a typical barn that I entitled The K. Lee Shay Barn (say it fast, it should come out The Cliche Barn). I know my own cliches. Years ago a historian friend of mine and I would drive around the area doing historical surveys. When we’d see what I thought was an interesting barn I’d ask to stop to take a photo. His frequent reply, as we drove on, was “you can make up a better barn than that.” He knew my cliches too. I used to doodle in my notebooks in school .Faces of non specific person, flowers and fishes. Sometimes I decorated the cover of my projects from these doodlings and they were pretty good. Now I draw subjects for my work from memories of my childhood. As the Philippines is mainly a Catholic country and had Spanish influence in our religious traditions we have prayer gatherings to celebrate an event. Neighbors and even beggars were invited and food was served as if in a party.There was a blind guitarist who was always invited and entertained the guests after the prayers. He is a sort of a balladeer his songs were of orphans who rise from his state and make good on own success. Neighborhhood children consisted the group and they learned to pray the rosary through this prayer gathering. As a child I was fascinated by his ballads and by him how he managed to entertain blind as he was and no songscripts or notes as reference. He was composing as he sang I believe and we were in awe. I have not started yet just trying to draw from memory the setting and to place the people.The place is usually the garden of the people who call for the gathering. I have no existing reference for the tableau because there was no pictures taken at these times.So it is taking me a long time to start. I wonder would anyone have any suggestions? The difference between looking and seeing: Seeing, truly seeing, is done when you are alone with your eyes. A companion can point things out, but they are his things, not yours. You alone begin to love and ultimately to service the objects of your sight. Boys draw cars and girls draw dolls. This is the root of the divide. There are getting to be a few more female auto designers these days. And many of the great fashion designers are men. So stereotypes are breaking down. Anyone can have fresh sight. Ive never drawn a doll in my life. (?) My greater passion was horses that later had me training, owning, and showing quite a few over several states. I was so familiar with my horses I could draw them with intimate knowledge of their skeletal and muscular system, the subtle difference in breeds, their expression and attitude in play, performance, or dozing in the sun. That only comes from acute observation. I recently completed a painting that had a cat in my photographic reference. Even though Ive always had a cat I was at a loss to render that poor pathetic thing I tried to make into a cat. Why? I didnt bother to observe and know this animal well enough. I wiped out the cat and painted a flock of sparrows instead, to the detriment of the painting. Lesson learned. Jackie, have you ever wondered why women, particularly teen-age women, become so enamoured and caregiving of horses? Last year when I visited your studio I expressed joy at seeing your ‘in progress’ canvas with a beautiful stand of larches. Truly magnificent, your painting brought back memories of late fall hiking in the East Kootenays in BC. But let me put in a plug for white barked Birches and Aspens . 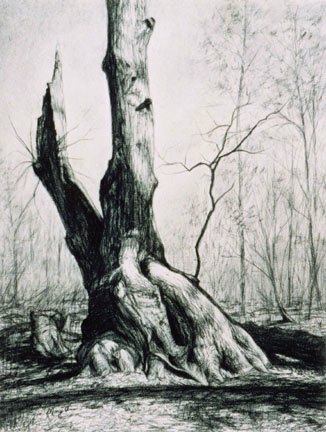 Old birches , some near death, others vibrant, take at least second place .The craggy bark- black and white, with shades of reds, greens and browns give the artist great options for painterly work. Lets call it a draw between Larches and Birches and give a vote of thanks for trees of all varieties . It’s not just looking and really seeing the larches, it’s a matter of really seeing your larches. Funny, I was reading Ann’s comment, & thinking the first words of Jackie’s post! I was a horse-nut. 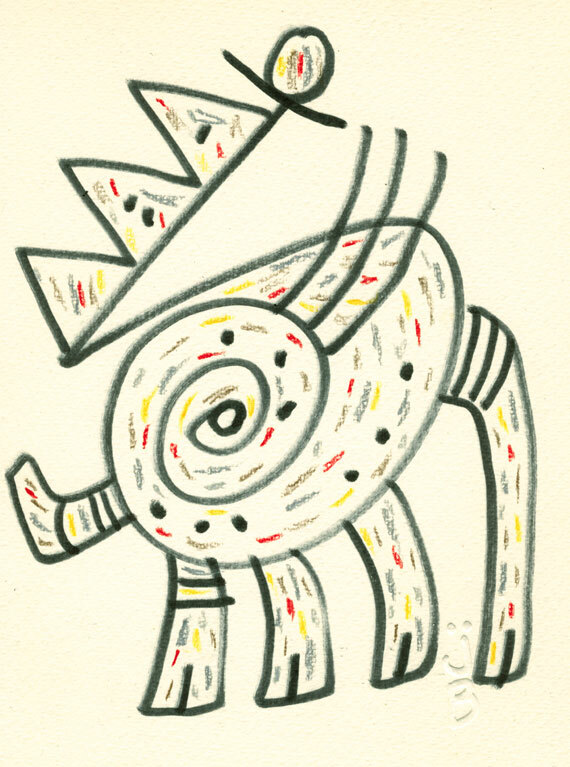 In fact, when I was a kid, I WAS a horse, & it was through horses that I found my way to art. I think the seed of learning how to draw, for me anyway, was the intense passion of wanting to possess the spirit of the horse… drawing & painting is an obvious method to express this passion. But I think that spark, that passion, for horses might have something to do with power, freedom, grace & above all, beauty, although there’s always that possibility of totem magic. As of the day before Christmas I’ve been on a spree of painting new ideas and I believe this fits with what is being said. 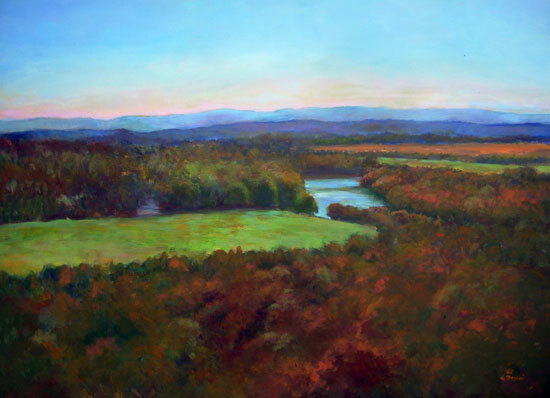 In the past I relied on “subject matter and specific images to paint including the model and landscapes. Just before the holiday I decided to toss all this out the window and search my soul and try and paint my heart. Needless to say I have the experience as a painter to try and paint whatever comes to mind believably. So I put aside all my references and began thoughts on what I would like to paint. I enjoy paint the human form and started doing something I’ve not done in years — Draw. I started putting my ideas into drawings and after a very short time these ideas started to become the start of paintings. Not to make this letter too long and not to brag or show off I have, to date from Christmas, created some twenty one new works, in sizes ranging from 8×10 to 20×24 in a completely different style and genre than I’ve ever created and this period still continues. Ideas lead to new and different ideas. I even wake in the night with ideas where I have to get up, make a small sketch, then go back to sleep. This may happen several times a night. For the first time since I started painting nearly thirty years ago I feel a renewed sense of vigor and excitement and energy that I’ve not felt in years. What is important here, for me, is I am painting what I want from my heart and my satisfaction level and sense of accomplishment is overwhelming. I am seeing with new eyes a subject I’ve painted for years and loving every minute. The choices I make and procedures I use are mine. It’s like exploring new unchartered territory. Some get done in one full day. Some take longer. At the suggestion of my wife I will increase the sizes to 30×40 and larger. She feels they would work in a larger format. These new works are presently not up on my site but will be as I put aside the time to upload them later this month. I wish everyone a better year than last and the happiest painting year ever. I spent a summer painting red winged black birds.This past month I just returned from South Africa where I tried to capture some of the memories of my youth.It is such a beautiful country.My nephews wedding took place on a white white beach and the blue sea and blue sky made a beautiful background for memories that I shall hang to, I have lived in Canada for 30 years and had not seen my brother in 1 it was great to see my family.I have been trying to capture from memory some of the moments we spent together.Yellow weavers feeding in his garden.My brother is making these incredible bird houses can can be hosed down and are safe feeders, I never knew that he loved birds and animals as much as I do. On Wednesday I received the new book “Letters”–the one with all of them in. I read four letters last night from 2002. All I can say is that they are the most beautifully written, intense and authoritative pieces I’ve ever seen. I’ve had a good day today! Thank you also for honouring my special request for a dedication.